SUDOTECK released utility application FSpeed version 1.0 for cars. This application changes three screens on the basis of a speedometer using the GPS and displays the various kinds of information of cars. *For SAFE , operation of this application while driving is danger,please ask passenger, or, please use at a stop. ・Start GPS velocity measurement with START/STOP button of the top right corner and stop. When make START, with the sound of the engine start, meter movement is initialized. ・You can change the multi-display to a Manual mode (M), a clinometer mode(ANG), a map mode(MAP) to tapp the central knob. ・With the left knob, you can change a mode of the brightness of the screen and change the indication method of the map with the MAP mode. ・The left upper Fuel indication is not a thing measuring the fuel of the real car with the thing indicating the residual quantity of the battery. 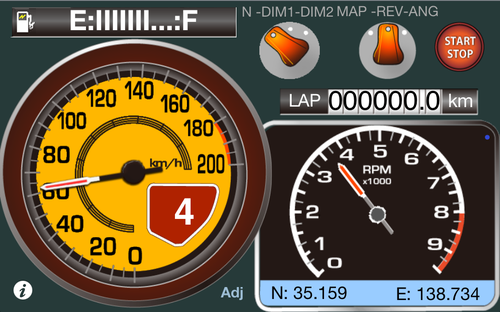 ・The LAP indication of the right center displays the mileage after it starts. You can clear numerical value when you tap an indication area. ・There is a function to indicate version number and jump to the support homepage with info button.